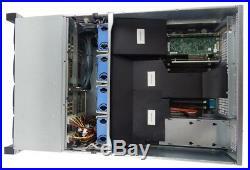 Chenbro 4u chassis with Foxconn motherboard is designed to run 24 HDD's as a storage solution. This combo is a great place to start; loaded with Dual E5-2670's, 64gb of RAM will get a NAS, Virtual Machine Host, Domain Server, 3D Rendering, etc. System up and running; just add some HDD's. With the Included RAID cards you can get a total of 22 (There is a place for two 2.5" drives above the power supply area with a non included Dual 2.5" Drive Tray) HDDs; 2 1SATA 6gpbs, 4 SATA 3gbps, and 16 SAS/SATA 6gbps CHASSIS: Model: Chenbro RM41824 4u 19" Rack Chassis Locking Rails: Included Form Factor: Extended ATX (12"x13") Dimensions: (D x W x H) 698 x 432 x 176 (mm), 27.5" x 17" x 6.9" Drive Bays: 24 3.5 Hot-swappable PSU Form Factor PS/2 Single or 2+1 Redundant Indicators 1 x Power Status 1 x HDD Activity 2 x LAN Activity 1 x Fan Failure and Overheat Front Buttons Power On/Off, Alarm Mute, System Reset, 2 x USB 2.0 System Security Intrusion Switch Cooling Fans Middle: 4 x 80mm (T=38mm), PWM, Hot-swap , Rear: 2 x 80mm (Option) Expansion Slots 1 Full Height 2 Low profile Metal Thickness 1.2mm. HDD Backplanes: 2x 84H341810-014 HDD Cage, 3.5" 12-bay, w/3pcs 4-port 6Gb/s mini-SAS backplanes 16x 3.5 or 2.5" HDD Caddies with non-locking eject latch and Status/Power Indicators. Power Supply(s): 100-120v Input Amps 12A Max Output 1023W +12v 82.75A +12Vsb 2.5A 200-240v Input Amps 8A Max Output 1200W +12V 97.5A +12Vsb 2.5A. 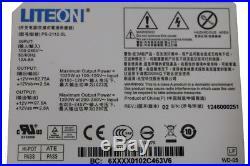 RJ-45 IS BMC/IPMI Only Chipset Intel C602 BIOS Brand American Megatrends Inc. 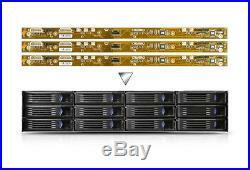 RAID Cards (two Lowprofile): Manufacture/Model LSI - SAS9211-8i - LSI00194 Type SATA / SAS Internal Connectors 2 x SFF-8087 mini-SAS Interface PCI-Express 2.0 Transfer Rate 6Gb/s RAID 0 1 1E 10. This motherboard doesn't have a RJ-45 port for Network to the OS. Motherboard Note The on-board NIC is connected through the second CPU socket, other on-board device might also be. CHASSIS NOTE This was special build for the included motherboard and case back. While other motherboard will fit and work, the case will need moderate to severe modification. 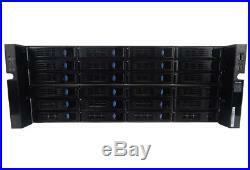 The item "Dual Intel Xeon E5-267064gb (8x 8gb)24bay 4u16 Caddy Storage Server" is in sale since Friday, February 2, 2018. 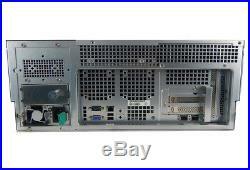 This item is in the category "Computers/Tablets & Networking\Enterprise Networking, Servers\Servers, Clients & Terminals\Computer Servers". The seller is "r2disassemblyllc" and is located in Erie, Colorado. This item can be shipped worldwide.